Beat ingredients together in a small bowl until well blended. Refrigerate for 1/2 hour. There is a carb counter in the back, but it is quite limited. There is also an index. There are no pictures. All of the recipes are not easy to follow and some of the ingredients seem like they would be hard to find. 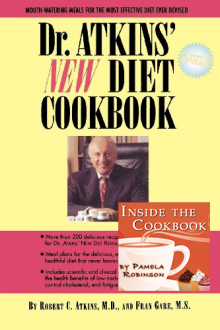 It disappoints me that this cookbook is so different than the original one that Dr. Atkins created. I would not recommend this book to someone new starting Atkins, but seasoned veterans may find several recipes to add to their collection.